New research in mice suggests that chronic infection with intestinal worms indirectly reduces the number of cells in lymph nodes near the skin, inhibiting the immune system's response to the Bacille Calmette-Guerin (BCG) vaccine for tuberculosis. Xiaogang Feng of Karolinska Institutet in Stockholm, Sweden, and colleagues present these findings in PLOS Pathogens. Many people worldwide receive the BCG vaccine to boost their immune response to bacteria that cause tuberculosis, lowering risk of the disease. Previous studies have shown that the vaccine, which is injected into the skin, is less effective in people with chronic intestinal worm infections, but the reason for this inhibition was unclear. To clarify how worms might hamper immune responses to the BCG vaccine, Feng and colleagues performed a series of experiments in mice. They examined how chronic infection with the intestinal worm Heligmosomides polygyrus affected the animals' immune response after BCG vaccine injection. Compared to worm-free mice, the researchers found, worm-infected mice had significantly smaller lymph nodes (key immune system structures), with fewer white blood cells in the lymph nodes, near the BCG injection site in the skin. These skin lymph nodes manage the immune response to the vaccine. 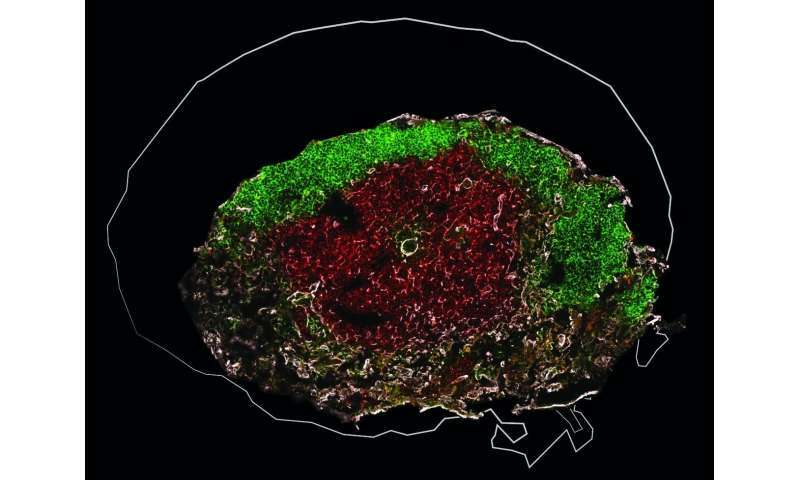 The lack of regulatory cells and molecules in skin draining lymph nodes made the researcher search alternative explanations to the impaired BCG response. Their results point to that the growth of the lymph nodes near the intestines (where the worms live), draw cells away from the skin lymph nodes. "During intestinal worm infection, gut draining lymph nodes expand at the cost of other lymph nodes and recruit a large proportion of circulating immune cells. Consequently, fewer cells reach the other lymph nodes which shrink and become compromised in their ability to mount responses to vaccines such as BCG." In further experiments, the scientists treated worm-infected mice with worm-killing medication. Three weeks later, the de-wormed mice had similar immune responses to BCG injection as those seen in worm-free mice, suggesting that the skin lymph nodes had recovered their function. Based on these results, the researchers hypothesize that intestinal worms in humans may inhibit the effectiveness of the BCG vaccine through their impact on lymph nodes near the injection site. The findings add to a small but growing body of evidence suggesting that de-worming treatments could restore the immune response to the vaccine. However, the new study suggests, the immune system may need a recovery period after de-worming before BCG is administered.